The United States and its allies have launched a military campaign whose stated goal is, in the words of President Barack Obama, to "degrade and ultimately destroy" the Islamic State (I.S., also known as ISIS or ISIL) established by Sunni jihadis in a contiguous land area stretching from western Iraq to the Syrian-Turkish border. 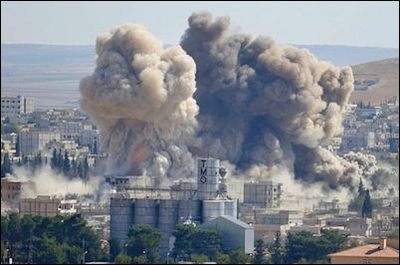 Smoke rises from a U.S. air strike on Islamic State positions in Kobani. Any state—even a provisional, slapdash, and fragile one like the jihadi entity now spreading across Iraq and Syria—cannot be "destroyed" from the air. At a certain point, forces on the ground will have to enter and replace the I.S. power. It is not yet clear who is to play this role—especially in the Islamic State's heartland of Raqqa province in Syria. In Iraq, the national military and the Kurdish Pesh Merga are now having some successes at chipping away at the Islamic State's outer holdings. The role of U.S. air support is crucial here. But the center of the Islamic State is not Iraq, and both the Iraqi forces and the Pesh Merga have made clear that they will not cross the border into Syria. This leaves a major question as to who is to perform this task, if the objectives outlined by President Obama are to be achieved. The Syrian rebels are characterized by extreme disunity, questionable effectiveness, and the presence of hardline Sunni Islamist elements among their most committed units. There are certainly forces of an anti-jihadist ideology among them—the most well-known being the Syrian Revolutionaries Front, headed by Jamal Ma'arouf from the Jebel Zawiya area in northern Syria, and the smaller Harakat Hazm. Both movements have benefitted from Western aid in recent months. The Syrian rebels are characterized by extreme disunity, questionable effectiveness, and the presence of hardline Sunni Islamist elements among their most committed units. The problem, however, is that these organizations are quite prepared to work with salafi groupings whose worldview is essentially identical to that of the I.S., even if their methods are somewhat different. Thus, if we observe the recent fighting between Assad's forces and rebels in the Quneitra area along the border with the Israeli Golan Heights, it is clear that the main contribution to rebel achievements came from the Jabhat al-Nusra group, which constitutes the "official franchise" of the core al-Qaeda group in Syria. But the fierce condemnations in recent days (even by supposedly "pro-Western" rebel groups such as Hazm) of the U.S. bombing raids into Syria indicate that there is a deeper problem here. The alliance between these Sunni rebel groups and the salafis has a common anti-Western component to it. Of course, the Sunni jihadis are not the only dangerous players on the ground. Another possible, no less troubling, outcome of the air campaign against the Islamic State could be the return of Bashar al-Assad's forces to eastern Syria, from which they have been largely expelled over the last year. It is not at all hard to imagine a scenario in which once the I.S. has been weakened by Western air attacks, the Syrian military and its Iranian-backed allies will be able to make gains. The Assad regime and its Iranian backers [are] enemies of the West of significantly greater potency and seriousness than the Islamic State itself. In the two scenarios discussed above, both quite plausible outcomes of a Western air campaign, the I.S. would be defeated and replaced by another version of Islamism—either that of its fellow Sunnis, or that of the rival Shi'ites. A third possibility, however, is that the White House does not actually intend to pursue a policy intended to physically destroy the Islamic State in its heartland in northern Syria. Certainly, more recent statements emerging from the Administration appear to be preparing to "walk back" the President's comments. White House Chief of Staff Denis McDonough said in mid-September that success for U.S. policy vis-à-vis the I.S. would come when the group "no longer threatens our friends in the region, no longer threatens the United States." This sounds like the introduction to a more modest policy of degrading I.S. capabilities, rather than seeking to "destroy" the Islamic State. What is taking place across Syria and Iraq, and across their borders into Lebanon, Turkey, and Iran, is a sectarian war, made possible because of the decline of the police states which for half a century kept the lid on sectarian differences. What is taking place across Syria and Iraq, and across their borders into Lebanon, Turkey, and Iran, is a sectarian war, made possible because of the decline of the police states which for half a century kept the lid on sectarian differences. The regional ambitions of Iran, which has clients and proxies in all three countries, exacerbate this dynamic. The attempts by Saudi Arabia to block Iran's advance toward the Mediterranean, and by Qatar and Turkey to sponsor various Sunni jihadi elements, have produced a far more confused, and far less effective, Sunni side in this struggle. Then, when the brutality of some of the rebels became apparent, Western public interest in supporting the rebels receded. Soon the I.S. emerged as the new bogeyman. Declarations for its destruction became de rigueur, though it is far from clear how this is going to be carried out—and a de facto alliance with Iran and its clients, at least in Iraq, has emerged. This was seen in the expulsion of the I.S. from the town of Amerli, a pivotal moment in the major setbacks faced by the organization in recent days. In that town, Shi'ite militias were backed by American air power—to telling effect against the Sunni jihadis. But is it really coherent policy to be backing murderous Shi'ite sectarians against murderous Sunni ones? It is not. Of course, when the West backs the Sunni rebels in Syria, the precise opposite is happening. Weaponry donated to "moderate" rebels then inevitably turns up in the hands of Sunni jihadis, who do most of the fighting associated with the Syrian "rebellion." The result is that in Iraq the U.S. is helping one side of the Sunni-Shia war, and in Syria it's helping the other side. This is what the proper coordination of allied states is supposed to look like. And it works in containing the conflict. To the east of the war's arena is of course Iran. To its west is the Mediterranean Sea. To its north is a long, contiguous line of Kurdish control, shared between the Kurdish Regional Government of President Massoud Barzani in northern Iraq, as well as the three enclaves created by the PKK-linked Democratic Union Party (PYD) in northern Syria. The YPG militia, which is the military force in these enclaves, has fought the I.S. almost since its inception, and has largely prevailed in keeping the jihadis out of the Kurdish areas. As part of a strategy of containment, the West should increase support for and recognition of both the Kurdish enclaves in the north of Syria and the Kurdish Regional Government itself. Such a principle of alliance will also encourage the West to reconsider the involvement of Turkey. As events of the last few years have shown, Turkey cannot be a reliable ally in the struggle against political Islam, because its ruling party, AKP, is itself an Islamist party. This is not a theoretical formulation. Turkey's support for Islamist militias in northern Syria and its opening of its border for them has been a major contributing factor in the proliferation of these elements. There is also considerable evidence that Turkey at the very least turned a blind idea to the activities of the I.S. in the border area in 2013, and may well have offered some help to the jihadis in their fight with the YPG. In order to grasp the rationale for a policy of dual containment, the nature of the war between rival sectarian forces must be grasped. There is also a need for the clear understanding that the effort to preserve at all costs the territorial integrity of "Iraq" and "Syria" is mistaken. Rather, what should take place is support for those forces committed to order, as listed above, and non-support for the forces of political Islam. Jonathan Spyer is a Middle East analyst focusing on Syria, Lebanon and Israeli strategic affairs. He is a senior research fellow at the Global Research in International Affairs (GLORIA) Center, Herzliya, a fellow at the Middle East Forum, and is the author of The Transforming Fire: the Rise of the Israel-Islamist Conflict (Continuum, 2011).